You can't beat the view of Braddock Cove from the patio at this South Beach villa rental! Perfectly positioned in South Beach, this lovely 3 Bedroom, 2 bath ground floor villa is waiting for you. 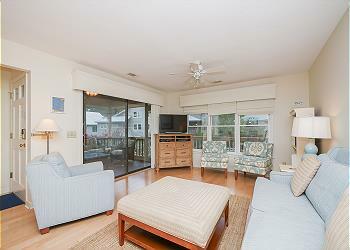 The living area is open and airy with views of Braddock Cove from every window. It is furnished with comfort in mind. The kitchen has an adjoining eating area with a breakfast table for 4 and the dining table which sits off in the living room seats 6. The master bedroom is outfitted with king bedding and updated private bathroom. Two more guest rooms share an updated hall bathroom, the first one has a Queen bed and the other bedroom has 2 twins. 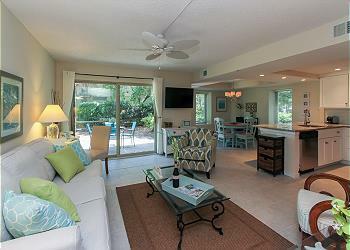 You are steps away from taking a stroll on the beach or just sit on your patio and admire your serene surroundings. Walk easily to the community pool, racquet club, and South Beach Marina for shopping, dining, and seasonal live entertainment.